CAR T cells have to be developed, optimized and validated in a pre-clinical setting by small-scale benchtop experiments. This application protocol describes a complete workflow for the engineering of CAR T cells for research. It includes isolation of donor T cells, followed by activation, gene-transfer of the CAR construct, CAR T cell expansion as well as the phenotyping and analysis of the final CAR T cell product. ▲ Note: Addition of penicillin/streptomycin to the T cell media is optional (e.g. 100× penicillin/streptomycin stock solution to a final concentration of 1×). ▲ Note: For manual cell separation autoMACS Rinsing Solution can be replaced by PBS-EDTA buffer. ▲ Note: For manual separation a MidiMACS™ Separator, MACS MultiStand, and MACS LS Columns can be used in place of the autoMACS Pro Separator. Table 1: Antibodies used for analysis of immune cell composition and transduction efficiency. CAR DR PE n.a. n.a. ▲ Note: Antibodies can be replaced/included according to your respective needs. For additional antibodies refer to www.miltenyibiotec.com/antibodies. ▲ Note: For additional CAR T cell phenotyping panels, e.g. to assess activation, differentiation, proliferation, and exhaustion of T cells, consult our experts at mquant@miltenyibiotec.de. All panels are compatible with MACSQuant® Express Modes. MACSQuant Analyzer, MACSQuant Analyzer 10 (# 130-096-343), or any flow cytometer equipped with violet (405 nm), blue (488 nm), and red (635 nm) laser and able to discriminate FITC, PE, PerCP, and APC. Supplement TexMACS™ Medium with MACS® Cytokines, Human IL-7, premium grade (500 IU/mL) and Human IL-15, premium grade (84 IU/mL). ▲ Note: Make sure to freshly add Human IL-7, premium grade and Human IL-15, premium grade to the T cell medium for effective T cell expansion. Prepare buffer by diluting the MACS® BSA Stock Solution 1:20 with autoMACS® Rinsing Solution or PBS/EDTA. ▲ Note: Keep buffer cold (2−8 °C). Degas buffer before use, as air bubbles could block the column. Prepare the 10 mM CFSE stock solution in 1 mL of DMSO. Use CFSE at a final concentration of 1 µL by diluting the stock solution 1:10,000 in PBS. Freshly prepare the following master mixes for each sample. ▲ Note: Store master mix in the dark in the refrigerator (2–8 °C) until use. Do not store for extended periods. Table 2: Master mix for immune cell composition antibody panel. Table 3: Master mix for transduction efficiency antibody panel. Reconstitute and dilute standard with MACSPlex Buffer, or use the same media as it is used for the dilution of the sample. Only use freshly prepared standard solutions. Do not store or reuse reconstituted or diluted standards. Use polypropylene or polystyrene reagent tubes. Do not use glass vials. The generation of standard curves requires eight samples: seven samples of the standard, and one blank control. These samples will be measured as duplicates. For details refer to respective data sheet. Thaw one vial containing the lyophilized MACSPlex Cytokine 12 Standard. Open the vial and add 200 μL of MACSPlex Buffer or media to the pellet and mix gently. This is the stock solution (10,000 pg/mL for IL-4, IL-5, IL-17A, IL-23, and 50,000 pg/mL for IL-2, IL-10, IL-12p70, IFN-γ, TNF-α, and GM-CSF). Pipette 200 μL of MACSPlex Buffer or TexMACS Medium into each tube. Perform a 1:5 dilution by transferring 50 μL from the stock solution to the tube labeled 1:5 and mix thoroughly. Continue making 1:5 serial dilutions by transferring 50 μL from the tube labeled 1:5 to the tube labeled 1:25 and so on to the tube labeled 1:15,625. Mix each dilution before performing the next transfer. 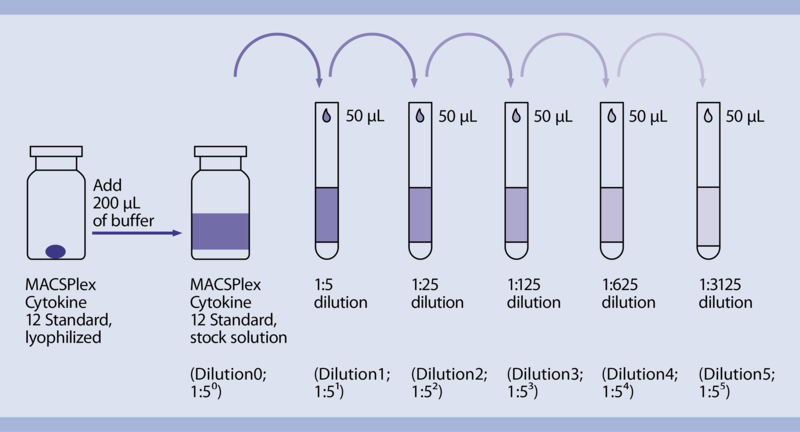 Figure 2: Serial dilution of the MACSPlex Cytokine 12 Standard. The peripheral blood or buffy coat should not be older than 8 hours and supplemented with anticoagulants (e.g. heparin, EDTA, citrate, ACD-A, or citrate phosphate dextrose (CPD)). PBMCs should be isolated by density gradient centrifugation, e.g., using Ficoll-Paque™. Resuspend cell pellet in an appropriate amount of PBS-EDTA and proceed to magnetic labeling. ▲ Note: PBMCs may be stored in the refrigerator overnight in PBS containing 0.5% BSA or autologous serum. Do not store cells longer than one day in the refrigerator. Wash at least once before proceeding magnetic labeling and resuspend cells in an appropriate buffer. For details see MACS® Cell Separation Reagents data sheets. For optimal performance it is important to obtain a single-cell suspension before magnetic labeling. Pass cells through Pre-Separation Filters to remove cell clumps which may clog the column. Wet filter with buffer before use. Refer to user manual for instructions on how to use the autoMACS® Pro Separator. All buffer temperatures should be ≥10 °C. Place tubes in the following Chill Rack positions: position A = sample, position B = negative fraction, position C = positive fraction. Resuspend cell pellet in 120 μL of buffer per 2×107 total cells. ▲ Note: (Optional) To compare purity before and after enrichment, remove a small aliquot (e.g. 50–100 μL) from the fraction and keep it on ice. Place sample (position A) and collection tubes (position B and C) into the Chill Rack. ▲ Note: Refrigerate Chill Rack overnight to ensure samples are kept at 4 °C. Mix CD4 and CD8 MicoBeads (1:1). ▲ Note: Mix at least 45 µL CD4 MicroBeads and 45 µL CD8 MicroBeads. ▲ Note: Shelf life of the CD4 and CD8 MicroBead mixture corresponds to the shelf life of the single CD4 or CD8 MicroBeads and can be stored at 2–8 °C until expiration date. Switch on the instrument for automatic initialization. Go to the Reagent menu and press the Read Reagent button. 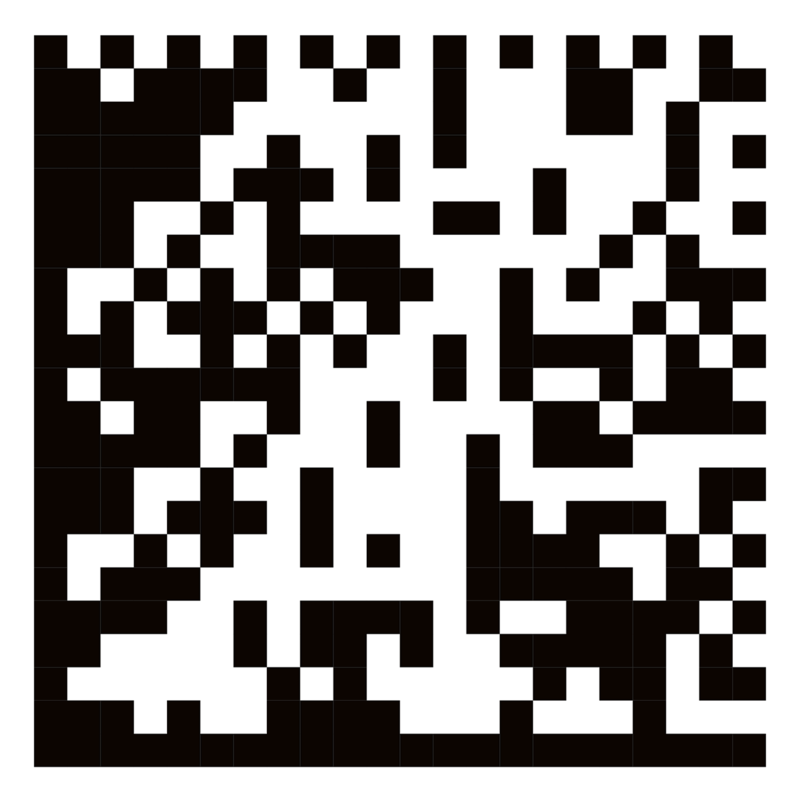 Scan the 2D barcode below. Alternatively, select Enter Reagent in the Reagent menu. Enter ‘130-999-995’ and select Custom_MicroBead_Mix. ▲ Note: Software update 2.4.7.0 is required. 8. Place the reagent into the appropriate position on the reagent rack. 9. Go to the Separation menu and select the position for each sample. Select Cust_MB from the Labeling submenu (the correct labeling, separation, and wash protocols will be selected automatically). 10. Enter sample volume (min. 120 µL) into the Volume submenu. Press Enter. 12. The positive fraction containing CD4+ and CD8+ T cells is collected in row C.
13. Remove positive fraction and proceed with section "(Optional) Analysis of purity before and after T cell enrichment". Additional antibodies can be included in the analysis according to the respective needs. For additional antibodies refer to www.miltenyibiotec.com/antibodies. Remove a small aliquot from the fraction representing the enriched CD4+ and CD8+ T cells (e.g. 50–100 μL). ▲ Note: For comparative analysis of CD4+ and CD8+ T cells before and after enrichment use also the aliquot from step 3.3. ▲ Note: Refer to section “Reagent and instrument preparation”, table 2 “Master mix for immune cell composition antibody panel”. Resuspend cell pellet in a suitable amount of buffer (e.g. 500 μL) for analysis by flow cytometry. ▲ Note: Cells must be acquired within 1 hour after staining. (λex 492 nm; λem 517 nm). Alternatively, every other cell proliferation dye can be used that does not interfere with the fluorochromes of the antibody panel. ▲ Note: Cell proliferation is usually analyzed on days 3, 6, 8, 10, and 12. However, please feel free to choose time points that are appropriate for your experimental needs. ▲ Note: To assess expansion rates, please also determine cell numbers, e.g., on days 3, 6, 8, and 10 using a Neubauer Chamber or the counting function of the MACSQuant® Analyzer 10. Resuspend cells to a final concentration of 2×107 cells/mL in PBS. Add the CFSE stock solution to a final concentration of 1 μM to the cell suspension (e.g. add 1 μL of 10 mM CFSE stock solution to 10 mL cell suspension). Mix well and incubate for 10 minutes at 37 °C. 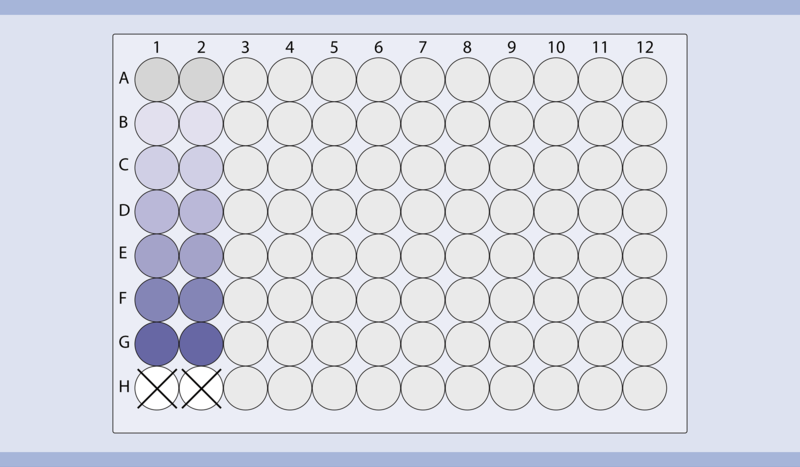 Resuspend cells to a final concentration of 2×107 cells/mL in TexMACS™ Medium without supplements. Repeat steps 7 and 8 to wash cells twice. Cells are now ready for activation and expansion. For optimal T cell stimulation EDTA must be removed. Ensure removal of EDTA (e.g. over 200-fold reduction). Wash cells twice with TexMACS™ Medium (without supplements) by filling the tube to the maximum volume and centrifuge at 300×g for 10 minutes. Aspirate supernatant completely. Resuspend T cells in TexMACS Medium supplemented with Human IL-7, premium grade (500 IU/mL) and Human IL-15, premium grade (84 IU/mL) to a final density of 1×106 cells per mL per cm2. Add the cell suspension into a suitable cell culture vessel (e.g. 2×106 cells in 2 mL/well of a 24-well plate). For details refer to table 4. Add T Cell TransAct™ to a final dilution of 1:100 and carefully resuspend. ▲ Note: The T Cell TransAct is soluble and applied using an optimized titer and not using bead-to-cell ratio. Incubate for in total 3 days at 37 °C, 5–10% CO₂. ▲ Note: Inspect culture daily and add fresh medium if required. ▲ Note: T Cell TransAct needs to be washed out after 3 days (refer to step 8.1). Table 4: Optimal surface density when working with purified T cells. When transducing T cells with a lentiviral vector the multiplicity of infection (MOI) should be calculated. In general, conditions for the viral transduction must be defined for each virus independently. The given step-by-step instruction is an example and must be adapted to your conditions. Include mock-transduced T cells as negative control. On day two (24 hours after application of T Cell TransAct™ to enriched CD4+ and CD8+ T cells), thaw lentiviral vector on ice following manufacturer’s recommendations and mix gently by pipetting up and down. Calculate the volume of lentiviral vector for transduction with a known T cell number and MOI. Add the required amount of lentiviral vector (e.g. CD19 CAR construct) to the T cell culture. Mix gently and incubate T cells for 48 hours (until day 4) at 37 °C, 5–10% CO2. Inspect culture daily. Depending on the expansion rate, it might be necessary to split culture more frequently than every 2–3 days. A 9-day expansion period should be adequate to obtain sufficient numbers of expanded lentiviral-transduced cells. Upon stimulation with T Cell TransAct, expression of CD3 will be transiently down-regulated. Thus, the antibody staining of CD3 on the cell surface of activated cells might be affected. On day 4, remove as much supernatant (containing T cell TransAct™ and the lentiviral vector) as possible from T cell culture, taking care not to disturb the cells. Adjust T cell culture medium to the previous volume by adding pre-warmed TexMACS™ Medium supplemented with Human IL-7, premium grade and Human IL-15, premium grade. When media is exhausted, split cell suspension into two equal parts and add TexMACS Medium supplemented with Human IL-7, premium grade and Human IL-15, premium grade. Incubate at 37 °C, 5–10% CO2. Repeat step 3 when media is exhausted (e.g. every 2–3 days), or when cells reach 80% confluency. Incubate for 9 days (until day 12) at 37 °C, 5–10% CO2. ▲ Note: The ideal cell density for T cell expansion until next splitting is 1–2×106 T cells per mL. On day 9 of expansion remove a small aliquot from the fraction representing the transduced CD19 CAR-expressing CD4+ and CD8+ T cells (e.g. 50–100 μL). ▲ Note: Transduction efficiency can also be determined before and within the CAR T cell expansion period. For each sample resuspend up to 106 nucleated cells in 100 μL transduction efficiency master mix. ▲ Note: Refer to section “Reagent and instrument preparation”, table 3 “Master mix for transduction efficiency antibody panel”. Resuspend cell pellet in a suitable amount of buffer (e.g. 500 μL) for flow cytometry analysis. For monitoring T cell proliferation rates samples of 25–50 μL are taken at appropriate points in time (e.g. day 3, 6, 8, 10, and 12) and diluted 1:2 with buffer. CFSE dilution is measured on the MACSQuant® Analyzer 10. At least 20,000 events are recorded. For determination of the T cell expansion rates samples of 25–50 µL are taken at appropriate points in time (e.g. days 3, 6, 8, and 10) and the count of viable cells is measured on the MACSQuant Analyzer 10. For dead cell exclusion propidium iodide is added prior to flow cytometric acquisition. Expansion rate is calculated afterwards. ▲ Note: Points in time can be adapted. For CAR T cell phenotyping, e.g. to assess activation, differentiation, proliferation, and exhaustion of CAR T cells, please feel free to directly contact our experts at mquant@miltenyibiotec.de. All CAR T cell phenotyping panels are compatible with MACSQuant® Express Modes. Antigen-expressing target cells must be chosen upon the respective CAR construct utilized for the viral transduction (e.g. co-culture of GFP+CD19+ JeKo-1 B cell lymphoma target cell line with CD19 CAR T cells). If you do not work with GFP+ target cells: target cell labeling can be performed using CellTrace™ Violet Cell Proliferation Kit. For detailed information refer to end of this section “(Optional) Target cell labeling for killing assay”. On day 12 set CD19 CAR T cells cytokine-free: Wash the cells twice with TexMACS™ Medium by filling the tube to the maximum volume and centrifuge at 300×g for 10 minutes. Completely aspirate supernatant and resuspend in plain TexMACS Medium without any additional Human IL-7 , premium grade and Human IL-15, premium grade. Seed target cells (e.g. JeKo-1 GFP+ CD19 surface protein-expressing target cells) and control cells (e.g. JeKo-1 GFP+ CD19 knockout cells), respectively, in a 96-well plate. After 24 hours of cytokine-free cultivation determine CAR T cell number. E:T ratios (e.g. 10:1, 5:1, 1:1, 0.2:1). Co-culture CAR T cells with respective target cells for 24 hours. Remove 96-well plate from the incubator and incubate for 20 minutes at 2–8 °C. ▲ Note: (Optional) Supernatant of the E:T 1:1 condition can be used to determine secreted cytokines using MACSplex Assays (please refer to section 10.4). (Optional) Take out 100 µL of the supernatant of each well of the 96-well plate for the cytokine analysis (section 10.4) and fill up with 100 µL of fresh TexMACS Medium without supplements. The killing rate is determined by analyzing the GFP fluorescence intensity of the target cells using the MACSQuant® Analyzer. Make sure that for measurement sufficient running buffer and washing solution are in the containers of the MACSQuant Analyzer. Refill if the levels are low. Additionally, the waste container must be empty. Make sure that propidium iodide is automatically added by the MACSQuant Analyzer using the autolabel function. Define the sample volume (200 µL) and the uptake volume (100 µL). Choose the Acquisition Mode “High” and activate mixing. Start the acquisition of all samples. For results refer to figure 8 in section “Results”. If you do not work with GFP+ target cells: target cell labeling can be performed using CellTrace™ Violet Cell Proliferation Kit. Dilute CellTrace Violet dye stock solution to 1 μM using sterile 1× standard buffer. Calculate the volume to adjust the cells to a final concentration of 5×106 cells/mL. Discard supernatant and resuspend the cell pellet in the calculated volume of CellTrace Violet dye staining solution, mix well, and incubate for 5 minutes at 37 °C, 5% CO2. After incubation add 5 mL of FCS and 5 mL of TexMACS Medium (without supplements). Centrifuge the cells at 300×g for 10 minutes. Discard supernatant and resuspend the cell pellet in 5 mL TexMACS™ Medium. Calculate the volume to adjust the cells to a concentration of 1×105 cells/mL. Discard supernatant and resuspend the cell pellet in the calculated volume of TexMACS Medium. MACSPlex Assays are designed for determining concentrations of soluble analytes in a single sample. The analysis is based on MACSPlex Capture Beads, which display defined fluorescence properties and can be identified using standard flow cytometry techniques (figure 4). The MACSPlex Cytokine 12 Kit, human is used to detect GM-CSF, IFN-α, IFN-γ, IL-2, IL-4, IL-5, IL-6, IL-9, IL-10, IL-12p70, IL-17A, and TNF-α. Figure 4: Detection of MACSPlex Cytokine 12 Capture Bead populations in a MACSPlex-FITC (B1) versus MACSPlex-PE (B2) dot plot. Additional cytokines can be included in the analysis according to the respective needs. For additional cytokines refer to www.miltenyibiotec.com/cytokines. Design your assay using two columns of the MACSPlex Filter Plate for the standards. Add each of the seven standard samples in duplicates next to each other. Standards should be run in order from the lowest concentration (blank control: 0 pg/mL) to the highest concentration (stock solution: 10,000 pg/mL or 50,000 pg/mL). Start with the unknown sample in the next column of the plate. For more details, refer to the respective data sheet, section ”Protocol for the assay using the MACSPlex Filter Plate”. Figure 5: Setup of the assay using a 96-well plate. Pre-wet required wells of the MACSPlex Filter Plate with 200 μL of MACSPlex Buffer per well and aspirate off using a vacuum manifold designed to accommodate the filter plate (max. -300 mbar) until the wells are drained. Add 50 μL of MACSPlex Buffer or media as a blank control, 50 μL of each dilution, and the stock solution of the MACSPlex Cytokine 12 Standard to the corresponding wells of the filter plate. Resuspend MACSPlex Cytokine 12 Capture Beads by vortexing for at least 30 seconds and transfer 20 μL of MACSPlex Capture Beads to each well. Add 20 μL of MACSPlex Cytokine 12 Detection Reagent to each well. ▲ Note: Perform the flow cytometric acquisition on the same day, as prolonged storage of samples can result in increased background and reduced sensitivity. ▲ Note: Keep samples protected from light by using the protection lid during the flow cytometric acquisition with the MACSQuant Instrument. The kit includes MACSPlex Setup Beads for flow cytometer setup. MACSPlex Setup Beads are not required when using the MACSQuant Analyzer or MACSQuant Analyzer 10 but for all other flow instruments that can detect FITC, PE, and APC. ▲ Note: The kits are not suitable for use with the MACSQuant VYB. Calibrate the MACSQuant® Instrument using MACSQuant Calibration Beads (# 130-093-607). For details, refer to the data sheet of the MACSQuant Calibration Beads. After successfully completing the calibration, the MACSQuant Instrument is ready for measurement. No further steps are required as all necessary setup steps are performed automatically during calibration. The analysis of MACSPlex Cytokine 12 Kit, human requires a flow cytometer with a blue (e.g. 488 nm) and a red (e.g. 635 nm) laser, which can detect FITC, PE, and APC. For setting up these cytometers use MACSPlex Setup Beads (included in the kit). For instructions on the setup procedures of other flow cytometers, please refer to the application note "General instructions for MACSPlex Cytokine Kits" available on the product page at www.miltenyibiotec.com/130-101-740 in the "Library" section. To perform the acquisition and data analysis of the MACSPlex Cytokine 12 Kit, human with the MACSQuant® Instrument it is recommended to use the Express Modes MACSPlex_Standard and MACSPlex_Sample to achieve automated measurement and data analysis. For details refer to the special protocol “Data acquisition and analysis of MACSPlex Cytokine Kits using the MACSQuant® Analyzer Express Modes” available at www.miltenyibiotec.com/130-099-169 in the "Library" section. The minimum version number of the Express Mode package needed to run the assay on the MACSQuant Instrument can be found there as well. To check the version number of your Express Mode package available on your MACSQuant Instrument please select Help> Info> expressModes within the MACSQuantify™ Software. The version number of the Express Mode package is increasing with each Express Mode updates. Make sure the MACSQuant Instrument contains an Express Mode package with at least the same or higher version number than the special protocol is marked with. For results refer to figure 9 in section “Results”. Figure 6: Flow cytometry analysis before and after magnetic cell separation. In order to generate functional CAR T cells, human CD4+ and CD8+ T cells were isolated from PBMCs by positive selection using a mixture of CD4 and CD8 MicroBeads (1:1). Isolated CD4+ and CD8+ T cells exhibited a purity of >98%. Figure 7: Flow cytometry analysis of transduced T cells after expansion on day 12. After transduction and expansion, cells were analyzed for CD4+, CD8+, and expression of CD19 CAR. (A) Of all viable leucocytes >99% were CD4+ or CD8+ (based on CD45 expression, 7-AAD fluorescence, and scatter signal). (B) More than 56% of all CD3+ cells expressed the CD19 CAR construct. 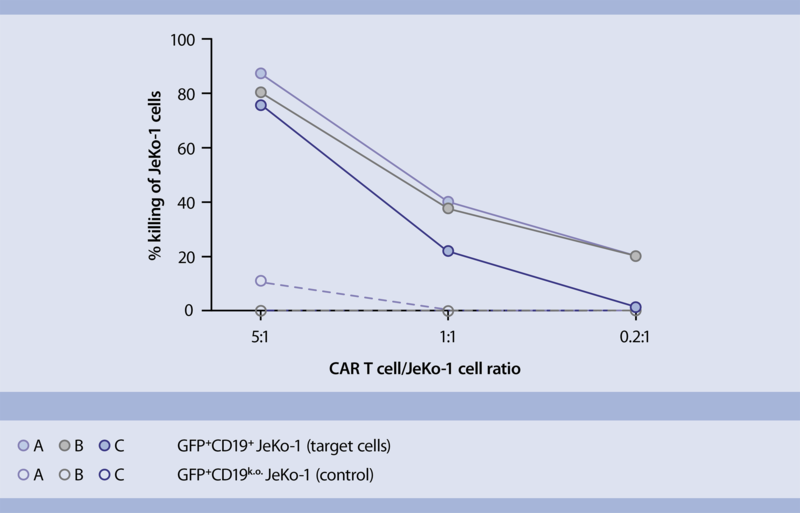 Figure 8: Killing of GFP+CD19+ JeKo-1 target cells by CD19 CAR T cells in a ratio-dependent manner. CD4+ and CD8+ T cells were isolated from PBMCs of three independent donors (A–C) and CD19 CAR T cells were manufactured as described. On day 12, CD19 CAR T cells were functionally tested in a killing assay. Transduced T cells were co-cultured with either the GFP+CD19+ JeKo-1 mantle cell lymphoma target cell line or a CD19 knock out (k.o.) variant control at indicated ratios. The killing rate was determined by analyzing the GFP fluorescence intensity of the target cells using the MACSQuant® Analyzer. Flow cytometry analysis showed about 80% killing of target cells at a 5-fold excess of CD19 CAR T cells. When changing the ratio by decreasing the number of CAR T cells, max. 18% of the target cells were killed. In contrast, the CD19k.o. 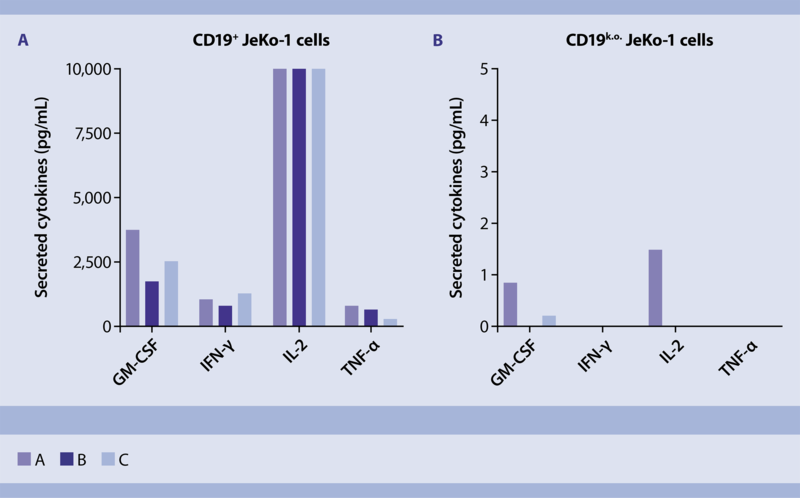 JeKo-1 variant control cells were not killed by the CD19 CAR T cells, highlighting the specificity of the CAR T cells. Figure 9: Cytokine analysis (GM-CSF, IFN-γ, IL-2, and TNF-α) of co-culture supernatant using MACSPlex Cytokine Kits. CD19 CAR T cells from three independent donors (A–C) were cultivated for 20 hours with the respective target cells (CD19+ JeKo-1 and CD19k.o. JeKo-1 ). Cell culture supernatants were harvested and centrifuged to remove particulates. Undiluted samples were analyzed using MACSPlex Cytokine 12 Kit, human. Two standard curves were carried out and the concentrations of 12 analytes were determined using MACSQuant Express Mode. The four most relevant cytokines (GM-CSF, IFN-γ, IL-2, and TNF-α) were displayed. (A) Upon recognition of CD19 receptor on the surface of the target cell the CD19 CAR T cells respond by the secretion of pro-inflammatory cytokines, whereas (B) co-culture with CD19k.o. target cells induce negligible amounts of cytokine secretion, confirming the functionality and antigen specificity of the CAR T cells. Figure 9: Cytokine analysis (GM-CSF, IFN-γ, IL-2, and TNF-α) of co-culture supernatant using MACSPlex Cytokine Kits. CD19 CAR T cells from three independent donors (A–C) were cultivated for 20 hours with the respective target cells (CD19+ JeKo-1 and CD19k.o. JeKo-1 ). Cell culture supernatants were harvested and centrifuged to remove particulates. Undiluted samples were analyzed using MACSPlex Cytokine 12 Kit, human. Two standard curves were carried out and the concentrations of 12 analytes were determined using MACSQuant Express Mode. The four most relevant cytokines (GM-CSF, IFN-γ, IL-2, and TNF-α) were displayed. (A) Upon recognition of CD19 receptor on the surface of the target cell the CD19 CAR T cells respond by the secretion of pro-inflammatory cytokines, whereas (B) co-culture with CD19k.o. target cells induce negligible amounts of cytokine secretion, confirming the functionality and antigen-specificity of the CAR T cells. Miltenyi Biotec provides products and services worldwide. Visit www.miltenyibiotec.com/local to find your nearest Miltenyi Biotec contact. Unless otherwise specifically indicated, Miltenyi Biotec products and services are for research use only and not for therapeutic or diagnostic use. MACS® GMP Products are for research use and ex vivo cell culture processing only, and are not intended for human in vivo applications. For regulatory status in the USA, please contact your local representative. MACS GMP Products are manufactured and tested under a quality system certified to ISO 13485 and are in compliance with relevant GMP guidelines. They are designed following the recommendations of USP <1043> on ancillary materials. The CliniMACS® System components, including Reagents, Tubing Sets, Instruments, and PBS/EDTA Buffer, are designed, manufactured and tested under a quality system certified to ISO 13485. In the EU, the CliniMACS System components are available as CE-marked medical devices for their respective intended use, unless otherwise stated. The CliniMACS Reagents and Biotin Conjugates are intended for in vitro use only and are not designated for therapeutic use or direct infusion into patients. The CliniMACS Reagents in combination with the CliniMACS System are intended to separate human cells. Miltenyi Biotec as the manufacturer of the CliniMACS System does not give any recommendations regarding the use of separated cells for therapeutic purposes and does not make any claims regarding a clinical benefit. For the manufacturing and use of target cells in humans the national legislation and regulations – e.g. for the EU the Directive 2004/23/EC (“human tissues and cells”), or the Directive 2002/98/EC (“human blood and blood components”) – must be followed. Thus, any clinical application of the target cells is exclusively within the responsibility of the user of a CliniMACS System. All other Products of the CliniMACS Prodigy Product Line are available for use only under an approved Investigational New Drug (IND) application. CliniMACS MicroBeads are for research use only and not for human therapeutic or diagnostic use. autoMACS, CliniMACS, CliniMACS Prodigy, CryoMACS, MACS, MACSQuant, MACSQuantify, TexMACS, TransAct, the MACS logo, VioBlue, VioGreen are registered trademarks or trademarks of Miltenyi Biotec GmbH and/or its affiliates in various countries worldwide. Ficoll-Paque is a trademark of GE Healthcare companies. All other trademarks mentioned in this publication are the property of their respective owners and are used for identification purposes only. Copyright © 2019 Miltenyi Biotec GmbH and/or its affiliates. All rights reserved.